Concierge Med Spa, with offices in Geneva, Barrington and Long Grove, Illinois, provides CoolSculpting treatments throughout the entire Chicago area including Naperville and Aurora. CoolSculpting is a non-invasive fat removal method that is used to restore curves to your body’s stubborn fatty areas like the abdomen, back and love handles. This procedure has been cleared by the FDA and is completely safe and extremely effective. The process is Cryolipolysis, which freezes the fat in the treated area. Once the cells are frozen, your body will naturally eliminate the fat through your waste. This is the non-invasive alternative to cosmetic surgery. It allows you to obtain the figure you use to have or have always wanted without the use of needles, cutting, pain, or downtime. 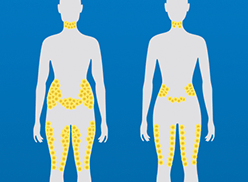 CoolSculpting is the answer for the problem areas that do not respond to diet and exercise. CoolSculpting’s revolutionary, minimally-invasive liposuction alternative, uses the basic science of cryolipolysis to freeze and dissolve unwanted fat cells present in your “problem” areas with no needles, special diets, or intensive surgery required. Not to mention, the results are proven, noticeable, and lasting. Which means regardless of where your insecurities were before, you will look great from every angle. We truly believe you will like what you see. In the weeks and months following your procedure, your body naturally processes the fat and eliminates these dead cells. Once the treated fat cells are gone, they’re gone for good. Fat cells respond to extreme temperatures. Cool sculpting works by freezing fat. The fat is cooled down to right before the freezing point using special gel applicators; this turns it from a liquid state to a solid. The result is a reaction that causes the cells to shrink over time and your body will flush the fat out. How long is each CoolSculpting® treatment? How many CoolSculpting® treatments will I need? First, the treatment area will be marked where CoolSculpting is needed or wanted. A gel pad is applied to protect your skin. Then a vacuum applicator to cool the fat cells under your skin will be applied to the marked area. The skin will be pulled up between two cooling pads. A slight pulling followed by a cool numbing sensation is how clients have described the process. You will stay like this for 1 hour per area being treated.